Enclosed motor construction heater is desinged to protect the motor from debris, extending the motor life. 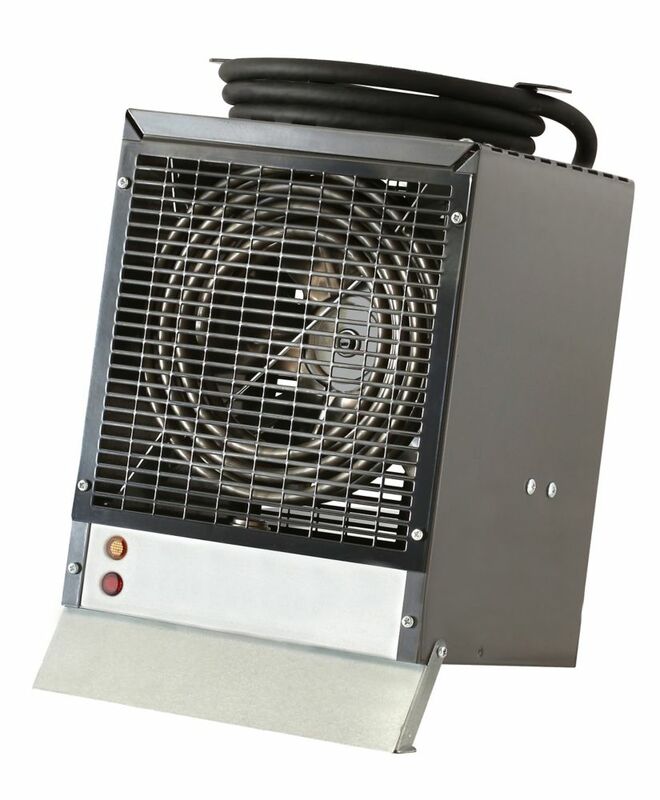 4800W, 240V Construction Heater with enclosed motor, yellow Enclosed motor construction heater is desinged to protect the motor from debris, extending the motor life. 4800W, 240V Construction Heater with enclosed motor, yellow is rated 4.4 out of 5 by 15. Rated 5 out of 5 by IdahoJim from Arrived on-time and worked right out of the box - no problems. Using it in a shop environment an... Arrived on-time and worked right out of the box - no problems. Using it in a shop environment and with the current summer weather cannot verify that it will heat the area (675 square feet) satisfactorily when used in winter conditions but have no doubts it will do the job. Runs quiet enough for shop environment and its enclosure gets too hot to touch, so maintain minimum space around the entire unit. It's a keeper in my book; I'd recommend it to others! Rated 5 out of 5 by wire from Quick heat for my basement workshop and didn't break the bank. Quick heat for my basement workshop and didn't break the bank. Rated 4 out of 5 by Austin from This heater is great for a large room or work... This heater is great for a large room or work area. It provided more heat than initially thought from the look of it, don't let the small size fool you! Not recommended if there is no 240V outlet available for use though, it is fairly difficult to find some sort of adapter for this heater. Rated 5 out of 5 by Kris13 from I've only had this running for a couple of days.... I've only had this running for a couple of days. It seems to be keeping my garage at 58 degrees, just where it had been set. Rated 5 out of 5 by abababababa from Bought it to heat a detached garage/workshop whilst still finishing the interior in temperatures down to -15 celsius outside. Worked very well for my needs with even a partially insulated structure of about 375 square feet inside. The only annoyance was that the listing on the website stated that it came with a NEMA 6-20P plug, however, it's a 6-30P plug. Rated 4 out of 5 by droid from Overall, satisfied with this product. Works better in a smaller area such as my workshop; not qu... Overall, satisfied with this product. Works better in a smaller area such as my workshop; not quite productive and warm for a larger area such as the entire garage. Rated 1 out of 5 by HomeDepotCustomer from This heater was intended to provide heat for a work space. The unit was plugged in and ran for a... This heater was intended to provide heat for a work space. The unit was plugged in and ran for about an hour, until it shut down. It would not restart when I changed the dial settings. The only way I could get it to restart was take it out into the outdoor cold. When I brought it back in, It would restart,but only for a short time. I tried multiple scenarios on keeping it running, but nothing worked. I have come to the conclusion that the thermostat is defective. I will be taking it back to Home Depot and will upgrade to a better model.